This is an unedited version of my Sunday Times article from May 4, 2014. This week, the Irish Central Bank published its annual report for 2013. In the opening statement, Governor Patrick Honohan said: "The Bank’s key priorities included the ongoing repair of the banking system and achieving progress in the delivery of sustainable solutions for distressed borrowers. Significant progress was achieved on these fronts, though many tasks still remain to be completed." This was not a great moment to stake such a claim. In recent days, the state-controlled Ptsb, announced a substantial hike in variable rate charges on mortgages. Bank of Ireland, faced criticism for using a 'blunt force approach' with distressed borrowers. Central Bank data, highlighted in the annual report, shows that in 2013 lending to non-financial corporations in Ireland posted its steepest year on year decline since the start of the crisis, down 6 percent. Credit to households fell at the second fastest annual rate, down 4.1 percent on 2012. Mortgages arrears, including the IBRC mortgages sold to the external investment funds, as percentage of all house loans outstanding, were virtually unchanged year on year at the end of 2013. Reading through the Central Bank own financial accounts also reveals some significant insights into the inner workings of our financial system and its watchdog. 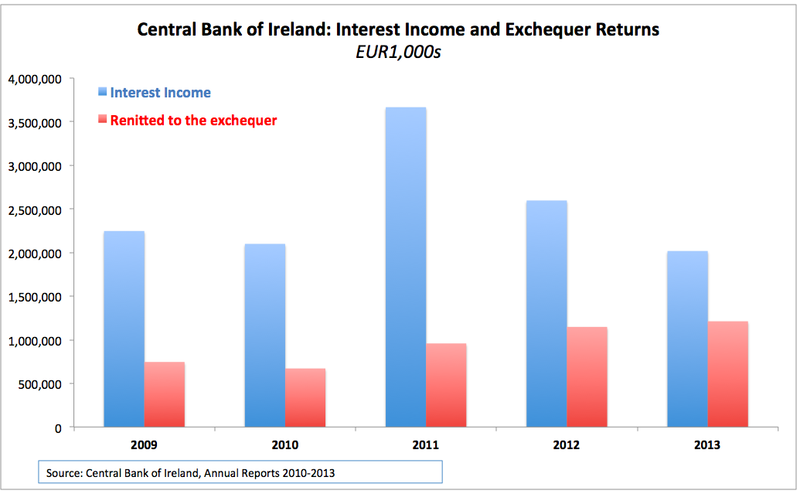 In the last three years, Irish Exchequer reliance on income from the Dame Street has gone up exponentially. In 2009-2013, the Central Bank paid EUR4.73 billion in total dividends to the State. Of this, 50 percent came from its operations in 2012-2013. This makes the CBI the largest net contributor to the State coffers of all public and semi-state organisations. The bulk of the Central Bank earnings come from interest on assets it holds. Last year marked the second year of declines in this income. Back in 2010, the Central Bank collected EUR3.67 billion worth of interest. As the scope of the emergency lending to Irish banks fell, the interest income also declined, reaching EUR2.6 billion in 2012 and EUR2.02 billion in 2013. Central Bank’s highest-paying assets today cover Irish Government Floating Rate Notes, NAMA bonds, and a Irish 2025 bond. All in, the money paid by the Government and NAMA to the Central Bank is being recycled back to the Exchequer at a hefty cost margin. In a sign of continued improvement in the Irish banks funding situation, marginal refinancing operations and long-term refinancing operations (MROs and LTROs), representing lending to credit institutions from the Eurosystem fell to EUR39.1 billion in 2013, down from EUR70.9 billion in 2012. At their peak in 2010, these lines of credit amounted to EUR132 billion. Central Bank’s staff-related expenses rose from EUR106.3mln in 2012 to over EUR121.4mln in 2013. These increases were down primarily to salaries, allowances and pensions, as staff numbers employed stayed relatively unchanged between 2011 and 2013. Per employee staff expenses are now up 15 percent on 2012 levels. Other operating expenses were up from EUR57.5 million to EUR70.3 million. The largest hikes incurred were in Professional fees, which rose by a quarter to EUR27.1 million. Only in 2011, at the height of banks’ recapitalisation, did the Central Bank manage to spend more on external consultants. So far, the banking crisis has been a bonanza for the Central Bank advisers who were paid EUR98.3 million in fees since 2009. In return for the rise in expenses, the Bank marginally expanded some of its enforcement and supervisory functions. There was a rise in prudential supervision activity, but a decline in authorisations and revocations of regulated entities. The number of investigations also fell, from 216 in 2012 to 184 in 2013. However, the Central Bank oversaw 1,004 regulatory actions taken in 2013, up on 2012, but down on 2011. Overall, the Annual Report paints a picture of the Central Bank continuing to engage in active enforcement and supervision, amidst overall declining need for banking sector supports.